Power Popsicles --- your favorite power smoothie on a stick! I’m kicking off the unofficial start of summer with a whole week of new popsicle recipes, tips, and useful links. Homemade popsicles are so incredibly versatile I need an entire week to explore all the reasons why you NEED these in your life this summer. 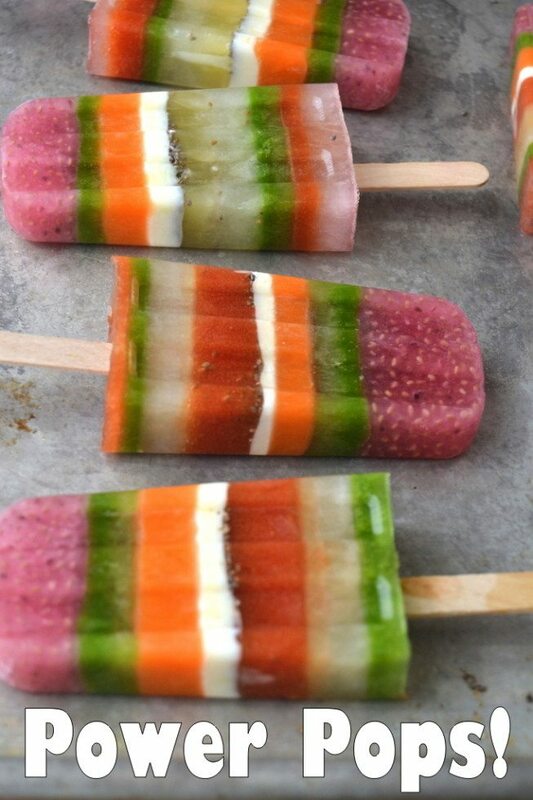 I’m dedicating each day this week to a different kind of popsicle, and today it’s these power smoothie striped popsicles. They’re fun to make, and so pretty! I’ve had a great time this week, I hope you have too — although I’m a little popsicled out, at least for the moment. But I couldn’t finish the week without doing at least one layered pop. Striped popsicles have become a specialty here on TVFGI. These are my Power Smoothie Striped Popsicles — basically my morning energy smoothie layered up in a popsicle. There’s coconut water, chia seeds, kale, carrot, yogurt, tomato, and pineapple. Whatever your favorite smoothie blend is, you can deconstruct it into a unique striped popsicle. 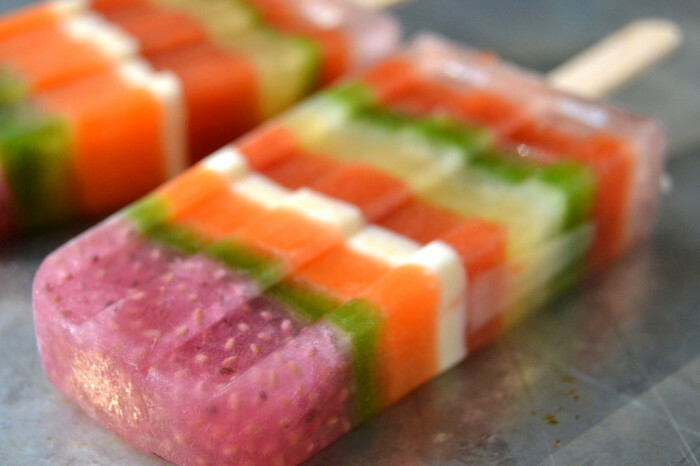 If you have a juicer you’re all set to churn out these super healthy popsicles. If not, just use ready made juice, or puree fruit in your blender or food processor. If you want to add seeds or wheat germ, mix them first with one of the liquids. 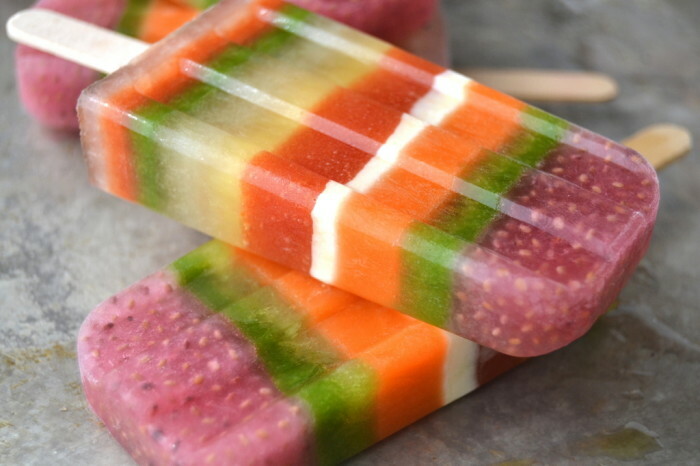 If the idea of veggies in your popsicle turns you off, focus on fruits and yogurt. If the healthy fruit and yogurt aspect of these popsicles appeals to you but you’re looking for something a little more straightforward, try my WILD BLUEBERRY AND ALMOND BUTTER YOGURT POPSICLES! For sharp stripes, use contrasting colors, and let each layer freeze completely solid before adding the next. And make sure your liquids are cold to begin with. For a more ombre effect, use similar tones, and experiment with laying down your layers before the previous one has solidified completely. Keep in mind that the first priority is that your popsicle taste great, so choose ingredients that go well together. Most fruit can be mixed and matched, and coconut milk or yogurt goes with everything. You will need approximately 1/2 cup each for 6 different layers in your popsicles. All ingredients should be cold to start with. Use a small glass measuring cup with a spout to easily pour the layers into your popsicle mold. Start with your first layer, and evenly pour a small amount into each mold. Freeze until firm. This might take 30-45 minutes. Lay down the second layer, and this time, cover the top of the mold with foil, and insert your sticks right through the foil. (Use a small sharp knife to make a slit in the foil first) Freeze again until firm, and continue your layers until you fill the molds. You can do even or random layers, it's up to you. To unmold the popsicles, fill your sink with hot water and immerse the mold up to, but not over, the top lip, for 15 seconds. If the pops don't slide out easily, immerse for a few more seconds. Store in plastic baggies in the freezer. 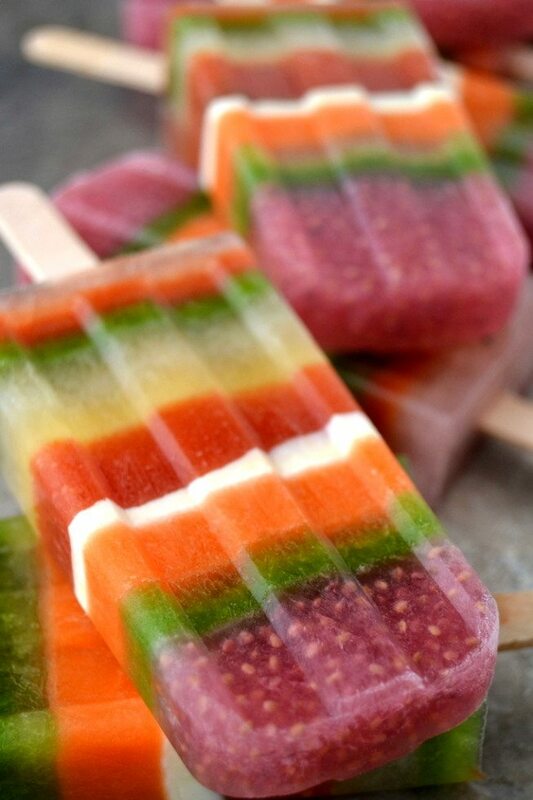 Don’t forget to pin these Power Smoothie Striped Popsicles! So looking forward to trying these new popsicles!!! Lovely lady!!! Beautiful looking popsicles you make. Sue these are gorgeous and so creative! Saw them on TS and pinned! So pretty. They could be on the cover of Bon Appetit. This is a great idea! I have trouble with the green smoothies. I dont know if it’s just psychological that there’s veggies in my smoothie. Maybe this would be an easier way for me to incorporate the greens and deal with the heat too. Thanks Sue! Wow, these are so pretty! I love the look of the colorful layers. Can’t wait to try some of your popsicle recipes. Lovely – the colors are amazing. Congratulations on a great Popsicle week! These are fantastic! Worth all the extra work, for sure. Just beautiful. Popsicles are what summer is all about and these are all gorgeous! These all look so refreshing for summer! What a fun week. 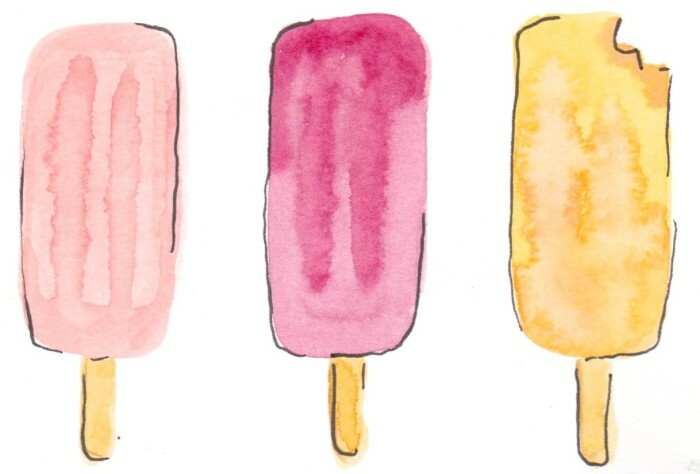 Popsicles make me remember being a little girl—–and that’s a good thing. You are making such wildly fun ones too. I am smiling as I am typing this. these are so cool! i love the colors. I must say, I think it’s unfair that all these adorable popsicle recipes around now…when my kids were little, we just froze kool aid. I mean really, how boring is that? I just love this combo, Sue! These look amazing and will be a great way to get some nutrition into little mouths. Also a great way to counteract the draw of the ice-cream truck which started making its summer rounds in our neighbourhood last week! These are a work of art, absolutely incredible!!! Wow! On my list to make popsicles this summer. 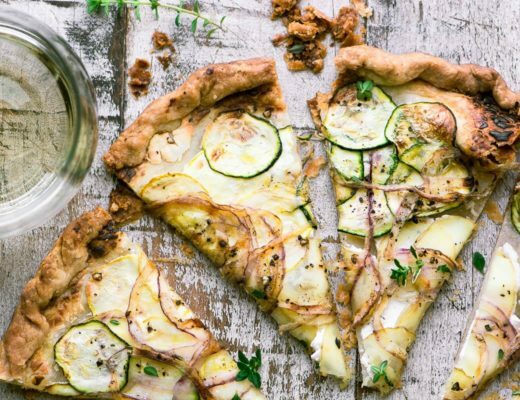 So many ideas and flavor combinations to think about. Who ate all of these at your house? You have the layered pops down, these are beauties! I am such a smoothie girl right now. These are awesom! I am so glad I found this blog! I love coming on here to read each night! It has been a great week! I’ve loved all your posts. You are so creative, and I feel very inspired to try some new popsicles! Great posts all week Sue. It’s been fun and actually entertaining to see what you’d come up with. Thanks Kate — but I have to say I was happy to put my popsicle molds away in the cupboard today! Sue, I’ve really enjoyed your ‘popsicle week’. I really wish I could try one of each of them you’ve posted! But especially this one … what a treat to have a new flavour in every bite! They are the prettiest pops I ever saw. Looks like a lot of work, but worth it. Thank you for the fun and informative week. A fan. Hi Sue, what a great end to your popsicle week. Love this layered look, if fact they all were wonderful in different ways. Have you thought of a book on just this subject? the possibilities are endless. 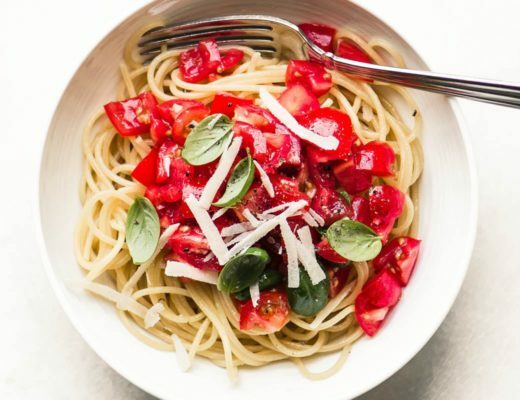 Your recipes make it even more diverse. OH MY!! The layers are amazing, don’t know if I would have the patience to do this. Have enjoyed popsicle week. Thanks Sandy, I think I’ve had enough popsicles for a while! I am SOOOO excited to try these. They will be perfect in the summer for an after workout refresher, that’s if I can hide them from all 5 kids :)! i am seriously loving all your creative popsicles this week! Love it! I never thought of making a tomato popsicle. Even though Popsicle Week is ending I hope you’ll still have a few throughout the summer. Something about them just screams sunshine and fun! Oh, I definitely owe you guys a few after the beet soup and the tomato!